The mystery of faces continuously forming and disappearing on the floor of a house started on 23rd August, 1971 in Spain. 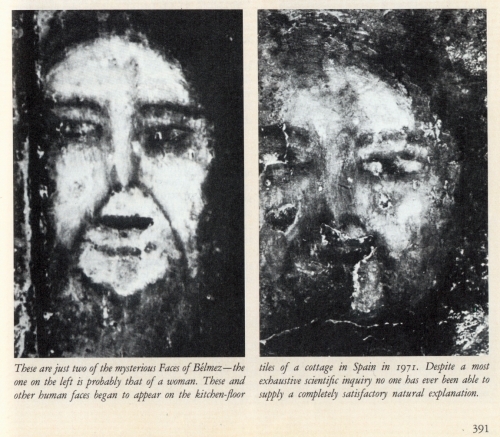 María Gómez Cámara claimed that human faces were formed on the concrete floor of her kitchen. María’s husband ‘Juan Pereira’ and their son ‘Miguel’ destroyed the image with a pickaxe and new concrete was laid down. Within a week’s time after ripping the floor the face appeared again in the same place on the floor. Again when they were planning to destroy the image, the mayor of Belmez forbade them from doing so. Instead the floor concrete was cut out and taken for study. Investigations were carried out on the site on which the house was built and it was revealed that the site was once a graveyard. The floor on which the faces appeared was removed and the place was dug to find what lay beneath. After digging, human remains were found. These remains were removed and the floor was laid back. After a couple of weeks a man’s face appeared again followed by many more faces. Some faces disappeared, some changed expressions and some became old. Several faces began appearing and disappearing within a day. Investigators took pictures of this images and tape recordings when the house was empty and locked. María’s home was advertised to the tourists as La Casa de las Caras (The House of the Faces). By Easter of 1972 the house became a centre of attraction and hundreds of people visited the house to see the faces. For the next 30 years the Pereira family claimed that faces continued to appear, both male and female and of different shapes, sizes and expressions. Nobody was able to explain the mystery behind it. After Maria passed away in 2004, investigators went again to check the faces. They found that the faces still continued to appear and disappear. Some said it was paranormal activity. Some claims suggest that the faces were manifested on the floor by telekinesis. This notion was based on the claim that the expressions on their faces used to change with the mood of Maria Pereira. 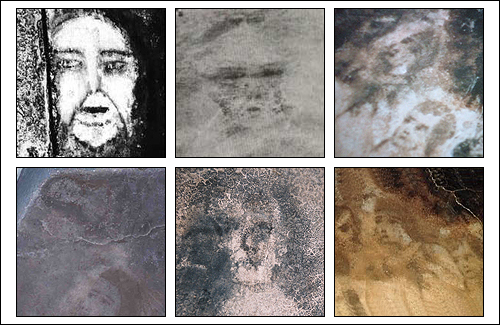 Scientists analyzed the molecular changes in the whitewash and proved that some fakery was involved and many believe that the faces were actually paintings done by Maria’s son, Diego Pereira.